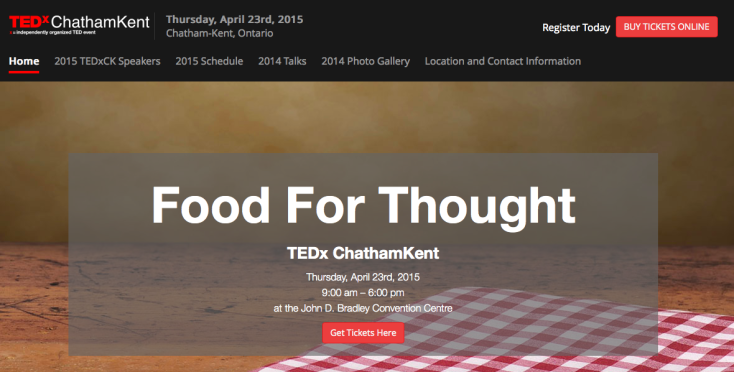 Yesterday was the second annual TEDxCK event (Chatham Kent). This year’s theme was”food for thought.” We had farmers, musicians, authors, teachers and even students in the building sharing big ideas. If I had to summarize the day into a few words, I would call it change and innovation. Regardless of your profession or industry, people are dissatisfied with the status quo. One talk in particular stuck out to me. Andrew Faas shared his research and thoughts on workplace bullying. As a teacher, we talk bullying all the time from the kid level. It was too shocking to hear the tragic workplace stories. A good opportunity for self reflection. I also had the chance to sit with Dave Kranenburg. He’s one pretty smart dude. I recommend checking out his work. A lot of his ideas are applicable to education and classrooms. Although I missed a chance to chat face to face with Paul Spence, we did connect online. Much respect for him as he challenges the farming system because he considers his kids future as being upmost important. Kudos to you, fellow troublemaker. Elizabeth Downey-Sunnen shared some insightful ideas around teaching kindness to kids She no longer gives tests and exams in her classroom. She finds more value in having conversations with kids. Jennifer Pate is on a mission to expose the plastics found in our great lakes. She’s a problem solver, adventurer and risk taker. Brian French’s talk was one every student should hear. We live in a world of databases. Be careful what information you submit. Kerry Taylor shared a different perspective on financial literacy. A $100 pair of jeans at 50% off is not a saving. You still spent $50. My talk was next. I shared my view on failure, risk taking and problem solving in classrooms. I wrote about it here. Jenn Kranenburg and her two students shared their challenge based learning project with local food banks. Pretty incredible the impact they have made here in CK. The day finishe with Jason Hall who has been featured in a Apple commercial. Jason shared a moving story from “Bikes and Murder” to #SlowRide. I encourage you to check him out. His story alone is a great message for students about determination. His global message of community resonated with me. All in all, it was a day of awesome-sauce. I think the participants outlasted the stage. Outstanding event! – #TEDxCK Thanks to @johnlyonsphoto @fanvav and their entire team for this inspiring day. Looking forward to next year!